There are a couple of workarounds for when you want to keep a photo locally and not in iCloud. How do take pictures off iCloud, but not have them deleted from my iMac, iPhone, and iPad? My iCloud is full and I want to clear it up by taking the photos off. In the past, I’ve said, sorry, it’s all or nothing. Once you opt into iCloud Photo Library, all of your images are synced across all devices that use the same iCloud login and have iCloud Photo Library enabled, and the full-resolution versions of images and videos have to be stored in your iCloud account. But I was being too restrictive in my thinking. There are ways around this situation, neither of which is ideal, but neither is completely a pain, either. Photos for OS X doesn’t let you split libraries; you’d have to export images from your existing library and re-import them into a new one. To switch among multiple libraries, quit Photos, hold down the Option key, and launch Photos. You’re prompted to select which library to open. If you’re willing to spend the princely sum of $30, you can purchase PowerPhotos, a third-party utility package that can merge, split, and manage Photos libraries. I’m a big fan of this software for adding functionality that Apple didn’t include. Create an album or albums in your main library that contain items you want to shift to a local-only library. Launch PowerPhotos and create a new Photos library or select a new one to which you want to add media. Copy the albums from your main library to this new local-only library. Return to the Photos app and select your main library, and then delete the photos in the copied albums. It’s possible you may lose some metadata in the process or be unable to revert to original for images that were modified within Photos, so keep that in mind. Photos for OS X only syncs media files to iCloud Photo Library that have been imported into the Photos library rather than copied. 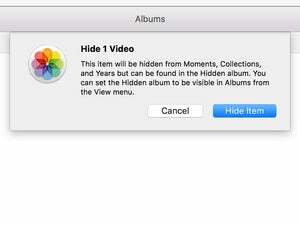 Photos for OS X copies all media by default, but you can disable this behavior: in Photos > Preferences in the General tab uncheck Copy Items to the Photos Library. Now when you drag items in or import them, Photos will create a reference to the file’s location on an internal, external, or networked volume. Referenced images can be used in Photos just like any others, but they’re not copied to iCloud. This means you should make a local backup of these non-imported files just as you would any other data that’s not also backed up in the cloud. You can opt to copy referenced images into a library later (select one or more items and choose File > Consolidate), but you can’t take an imported image and convert it to a referenced-only one. The biggest pain with this approach is that you will likely want to include or exclude images at different times from being synced when importing. You have to remember each time to check the Photos preference to ensure that the Copy Items checkbox is set as you want it for that import.